At-home dog bathing and grooming is trending for a couple of reasons. One is that, as pets have become more part of family life, people want to keep their dogs looking and smelling great between visits to the groomer, so they’re doing their own touch-ups as needed. 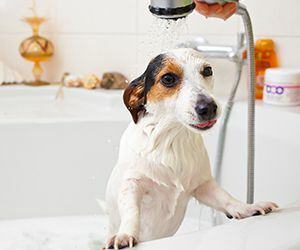 A second reason is that while it was once thought that too-frequent baths would strip a dog’s coat of oils, many veterinarians are now recommending weekly bathing to help reduce allergies and clear skin infections. So although pet parents may still splurge on the “luxury” of a groomer, many are finding it’s convenient and economical to give their dog in-between baths at home. The home bathing trend is creating opportunities for retailers to sell more specialty shampoos and other grooming products. In addition to stocking the right products, one of the keys to selling this category is to be able to provide consumers with information on when and how these products should be used, since many pet parents are looking for advice on home grooming. At Cardinal Pet Care, two of our most popular “tools of the trade” for home grooming are our REMEDY+RECOVERY Medicated Shampoo and REMEDY+RECOVERY Professional Groomer’s Styptic Powder. Here are some information and tips that retailers and their sales staff can share with pet parents that will help them use these products correctly – resulting in more sales for the store. 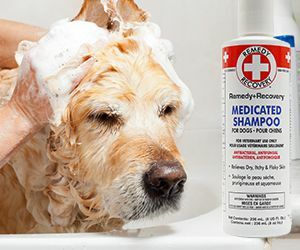 This medicated antibacterial and antifungal shampoo is ideal for dogs with many common types of skin dermatitis, such as scaling, flaking, dandruff and eczema. Its penetrating therapeutic formula relieves itching, kills bacteria, promotes healing and treats mildew and fungus. Gentle yet effective, the extra-conditioning formula contains botanical extracts of natural Chamomile, China Bark and Poplar Bark to moisturize and protect the skin and coat, leaving the hair shiny and manageable. Pet parents should follow the instructions on the bottle for normal bathing. But they should leave the dog lathered for 5-10 minutes before rinsing thoroughly so that the medicated formula has time to penetrate and saturate the skin. 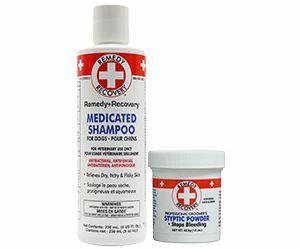 REMEDY+RECOVERY Medicated Shampoo is available in 8 oz. bottles. More pet parents are including nail trimming as part of their home grooming regimen. Styptic powder is essential for them to keep on hand to stop bleeding in the event the nail is cut too short and its “quick” or hyponychium gets nicked. REMEDY+RECOVERY Professional Groomer’s Styptic Powder is a dry powder that clots blood. It quickly stops bleeding due to clipping nails and other minor cuts and nicks and clipper burn. Users simply apply a pinch of styptic powder to the bleeding area and exert moderate pressure until the bleeding stops. If the bleeding does not stop, a veterinarian should be consulted immediately. 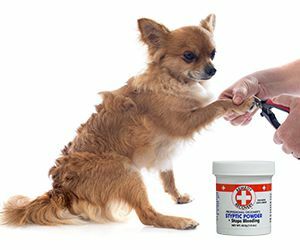 REMEDY+RECOVERY Professional Groomer’s Styptic Powder is intended for use on small superficial cuts to the skin and is not recommended for deep wounds, punctures or body cavities. It is available in 0.5 oz. and 1.5 oz. jars.